"I believe that men are generally still a little afraid of the dark, though the witches are all hung, and Christianity and candles have been introduced," Walden, 145. Learn more at the Danvers Historical Society. 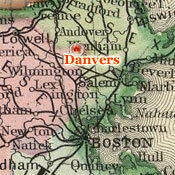 Map of the Town of Danvers, John Proctor, 1832. View full map at the Boston Public Library. 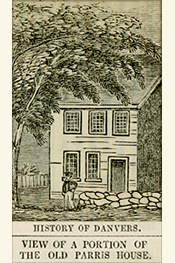 Visit the home of Rebecca Nurse, hanged in Danvers at age 71, on the charge of Witchcraft, March 19, 1692. 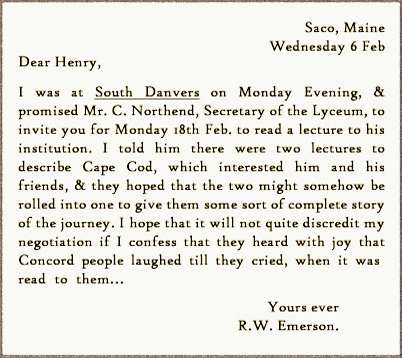 On February 6, 1850, Ralph Waldo Emerson wrote to Thoreau from Saco, Maine to urge him to accept an invitation to deliver his lecture on Cape Cod in South Danvers. Having delivered a two-part talk on his travels on Cape Cod a few weeks earlier in Concord, Thoreau condensed the two parts into one and read it at the South Danvers Lyceum on February 18, 1850. According to his lecture notes, he began by acknowledging that this somewhat hasty compression might not be entirely pleasing to his audience: "As I have already condensed three lectures into two, and I am now invited to roll those two into one...you can imagine how unconnected and incomplete this lecture must be." While he was obliged to abbreviate his narrative of his travels on Cape Cod on the lecture circuit, he expanded it over the next several years with an eye toward publication. 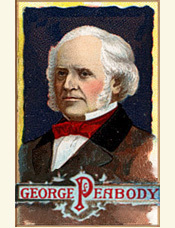 In 1855, four chapters of what eventually grew into his book-length travelogue appeared in Putnam's Monthly Magazine: "The Shipwreck," "Stage-Coach Views," "The Plains of Nanset,"[a misspelling of Nauset], and "The Beach." 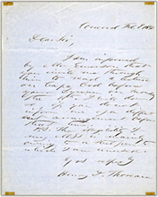 Thoreau had apparently agreed to contribute additional essays to this series, but due perhaps to differences with the editor, his old friend George William Curtis, about changes made to his work, or to Curtis's fear that the sometimes unflattering portrait that Thoreau drew of people of Cape Cod would offend too many readers, the series ended without notice. Thoreau did indeed upset the residents of Cape Cod, one of whom published an angry letter in the Boston Atlas in August 1855 complaining that the author of the series knew nothing of the region, that he had relied on entirely outdated sources, and that his distorted observations were the product of "a bewildered mind." Detail of S. A. Mitchell, County Map Of The States Of New York, New Hampshire, Vermont, Massachusetts, Rhode Island, and Connecticut (Philadelphia: 1860), David Rumsey Map Collection. 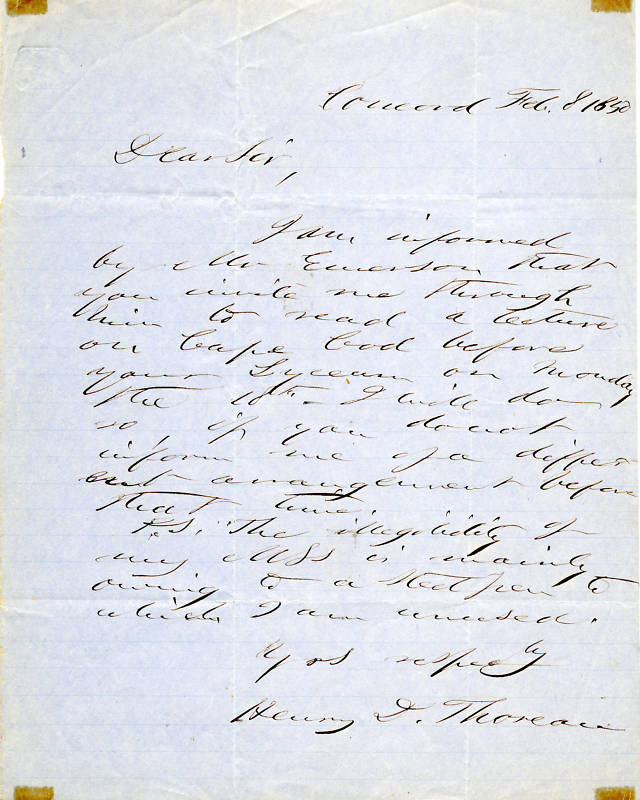 Thoreau's letter to Charles Northend accepting his invitation to lecture at the South Danvers Lyceum. Click to enlarge. 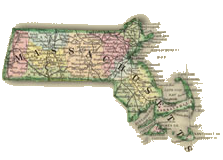 Visit the Danvers Archival Center at the Peabody Institute Library. 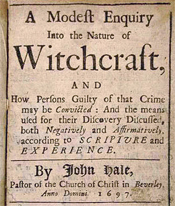 Danvers, formerly known as Salem Village, was the site of the infamous witch trials of the 1690's. Read J.W. 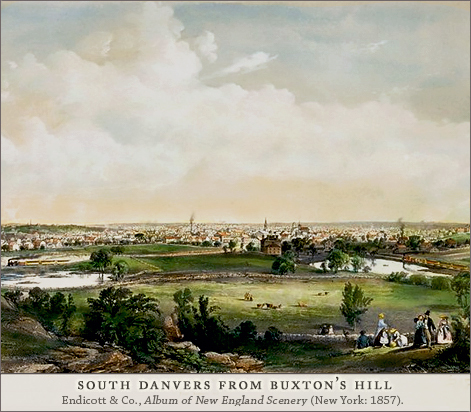 Hanson, History of the Town of Danvers, from its Early Settlement to the Year 1848.